The Kongs of The Jungle Return! 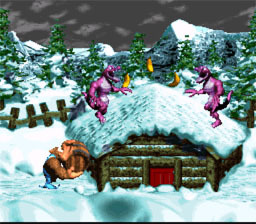 The Kongs are back for their 3rd adventure!! This time both Donkey Kong & Diddy Kong have been been Kongnapped and it's up to Dixie Kong and Baby Kong to save the two heroic apes! This game is the 3rd and final game in the original DKC trilogy and is also the hardest game in the trilogy. The game has a ton of levels and many of them are extremely unique e.g. a level in which you race through the level avoiding a giant saw moving quickly up the trees or a level which has moonlike gravity. If that wasn't exciting enough there is a secret area with many levels to find in the game. The game also has so many Minigames & secrets, not to mention side quests to do it feels more like an Adventure Platformer as opposed to a standard platforming title like most 2D platformers. The graphics are absolutely breathtaking. 3D sprites detailed backgrounds & even a few polygons. Which is hard to believe when you consider the game is over 15 years old. 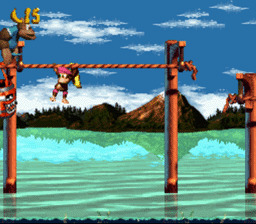 DKC 3 also features new animal buddies including a water squirting elephant. The sound effects are top notch and the soundtrack has a great variety of tunes most of which are awesome. Bottom Line: This is one of RARE'S best works and was years ahead of its time and for 800 Wii Points anybody who enjoys platformers would be banana's not to consider purchasing this gem. This is my least favorite snes Dkc game,but it's still more fun than a barrel of monkeys! This old review also needs pics. Rare was such an amazing developer back when Nintendo owned them. I feel your pain as I failed to download the best game of the series, Donkey Kong Country 2.